For the past 9+ years, my wife and I have been slowly building our side income by investing in dividend stocks. This year, we expect to make an extra $2,400 … just from dividend income. And next year, we expect to earn over $3,000 in dividend income. And while our dividend income stream is sustainable and will grow every year on its own … we are ready for more. We are ready to branch out and expand our side income streams. That is why last month, I highlighted our desire to start earning blogging income. We set a goal last month to build a sustainable income stream through an existing health and fitness blog that I run. Our goal is to earn $5,000+ per month in sustainable income by next June (2018). Here is a little bit more information about our health and fitness blog along with updates from last month. Each month that I post these updates, I plan to share a few statistics. I hope that these increase over time and next year I can look back and see how much my site has grown. Note – For now, I am only concentrating my social media efforts to mostly Pinterest, Twitter, and Instagram. I am planning to leverage the power of Pinterest to try and get a bunch of traffic right away. I also figure that Twitter and Instagram tend to be popular choices for sharing content on the Health and Fitness industry … so I will work to build up my following in those as well..
We set several high level goals for June for our Health and Fitness site. The goal is to eventually earn consistent income from this site of $5,000 per month by next June. In order to reach that type of consistent income, I am setting several smaller goals to get me closer. Unfortunately, I fell short for the blogging income goals we set for June. Since I started with an existing blog, I had a few decent articles already published on the site. Some needed a complete makeover while others needed a little tweaking. A few just needed to be removed entirely. Last month I had identified 2 articles that were candidates to become cornerstone or “pillar” type content for the site. My goal was to finishing tweaking them and add some images. Basically make it look pretty and get it to a 1,500 minimum word count. The first cleanup article was a post on Healthy Lifestyle Tips. I added some content and updated the existing post to make it a 1,560 word article. We added the images (see goals #4 & #5 below) and worked a little on SEO. This article is in good shape now and should provide benefits to my readers. I am still working on cleaning up the second article, which was a post on a Full Body HIIT Workout. The article currently stands at 1,182 words and I have some more content to add. I also need to add some images to make it look more professional. Overall, I made a little progress here in June but still need to finish cleaning up my second article. I came up short on this goal. My original thinking was that I would try and write 3 new quality articles of at least 1,500 words. Only 2 out of the 3 new articles were published. I only managed to finish two new cornerstone articles, one of which was a 1,580 word post on Yoga for Beginners. I found that I don’t know all that much about yoga right now, so I spent a lot more time researching actual yoga poses for beginners. The good news is that I learned a lot about yoga for beginners. And it is something that I am interested in myself. I also believe the quality of the article is top notch and will provide value to those who read it. The second new article covered the topic of Tabata for Beginners. I am very proud of this 2,259 word post that should provide a ton of value to future readers. In total, I have 14 published posts now (it was 19 last month) on my Health and Fitness blog. Of that total, 2 are existing posts (see goal #1) that I am working to revamp into awesome 1,500 word articles. Two additional posts (of the 14) are new cornerstone article (see goal #2) that I think will really provide value to my readers. That leaves 10 remaining posts. Back last month when I set my goals I had 16 posts I was to review. Well, after lots of contemplating, I decided to pull down 6 posts that just didn’t fit with where this site is headed. I am still in the process of figuring out what to do with these remaining 10 that I mentioned earlier. A few probably need to be re-worked a bit and will be fine while others may need to go away. So, I did do some work on this goal but didn’t finish it. My goal is to create several different images to use within each blog post I publish. In addition, I also plan to create specific images for each post that fit with certain dimensions of our social media accounts. After messing around with my blogging theme and how I want our posts to look, I decided on the image sizes that fit best. For each post, I plan to use one of the Pinterest images (mentioned above) within the content so my readers can easily Pin It. I also plan to use the Twitter image as a featured image within each post. I have an auto-poster plugin setup on my site that will immediately post this image with the blog title to Twitter. Every little bit counts I believe. Finally, I am using the 400px X 400px image for my blog page. I like to use a grid layout for my blog page and this image size just seemed to work best. It also helps that I can use it to post on my Instagram account. I will post more about creating images for my Health and Fitness site and those I publish here on The Money Sprout in a future post. One last thing I would like to add is that I have been using Tailwind for auto-posting images from The Money Sprout to Pinterest. I have had some good experiences using this tool and will likely add my Health and Fitness site soon. More to come! Since July is more than half over, I am not going to get too crazy setting goals this month. Plus, I still need to finish up a few things I didn’t get to last month. Goal #1 – Finish evaluating the remaining 10 articles on the site. I need to decide what to do with these articles – tweak them and make them useful or get rid of them. This is a priority at this point. Goal #2 – Finish that 3rd cornerstone article I didn’t finish in June. Goal #3 – Open up a Tailwind account and start building my Pinterest profile up. I believe that most of my traffic initially will come from this social media tool and Tailwind can help. Goal #4 – Research post topics and come up with 5 ideas for posts in August. I plan to start ramping things up in August with new content. Note – One last item, despite missing out on June’s goals … I did spend a bunch of time figuring out my blog theme last month and how I wanted everything to look. I probably spent way too much time on it but now that is done I can concentrate more on writing quality content and building our social medial accounts. 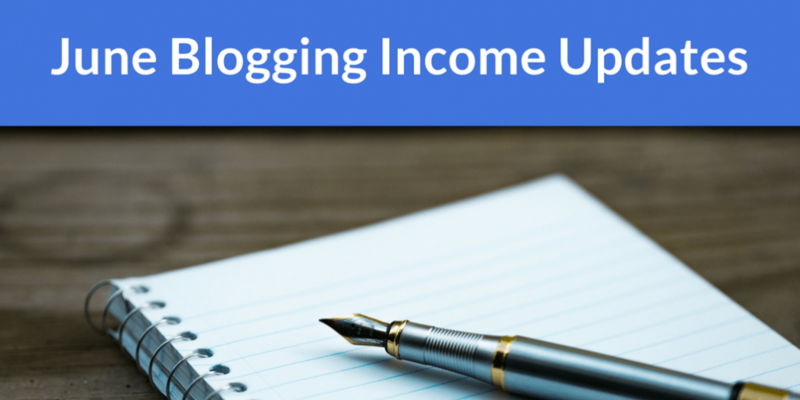 Are you earning blogging income? What strategies are you using to grow your site and income?